Union Budget 2018 is scheduled to be presented on February 1, 2018. In the run up to the budget we present you some interesting trivia from the past. 1. The first budget for India was presented on April 7, 1860 by East India Company to British crown. 2. In 1924, the Railway finances were separated from the general government budget. 3. The first budget of independent India was presented by India’s first Finance Minister R.K. Shanmukham Chetty on November 26, 1947. 4. 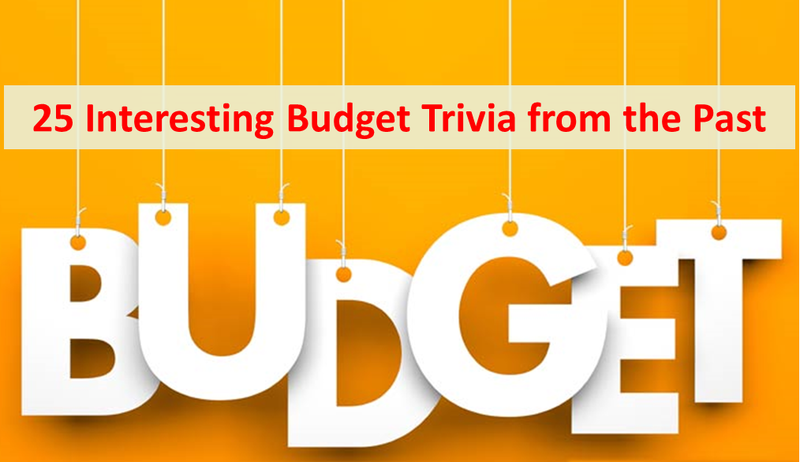 The budget date is decided by the President of India which is usually the last working day of February. 5. In earlier days the budget was presented at 5 PM in the evening. This was done to give some relaxation to officers involved all night in budget preparation. As we have followed many British practices, this too continued till Year 2000. 6. Yashwant Sinha began the new timing of budget speech by presenting the budget from 2001 at 11:00 am and it’s followed till date. 7. The budget printing starts with the Halwa ceremony – ritual in which ‘halwa’ is prepared and served to the entire staff in the Finance Ministry along with the Finance Minister. 8. The employees involved in the printing of budget are kept in complete isolation for one week before the budget. No one, except some senior staff, is allowed communication with their near and dear ones on phone or through any other form like email. 9. Initially, budget papers were printed in Rashtrapati Bhavan. But in 1950, the Budget papers were leaked. Thus the printing venue was shifted to security press located in Minto Road. However, since 1980, the Budget papers are being printed in North Block. There is a special printing press in the basement of the North Block to print the Budget. 10. The budget papers were earlier printed in English only. The Hindi printing started only from 1955-56. 11. Budget 1957 was the first one to differentiate between active (Salary, Business) Vs passive Income (rent, Interest, etc). 12. The concept of voluntary disclosure of concealed income was first introduced in Budget 1964-65. 13. The 1965-66 budgets contained the first disclosure scheme for black money. 14. Minimum Alternate Tax was first introduced by Rajiv Gandhi in 1987 Budget. 15. Services Tax was introduced by Manmohan Singh in budget 1994 to tap the growing sector in Indian economy. 16. The budget of 1973-74 was known as ‘Black Budget’ due to very high budget deficit. 17. The budget of 1992-93 is known as ‘Epochal Budget’ as it liberalized the economy and promoted foreign investments in India. The peak import duties were cut from 300% to 50%. 18. The budget of 1997-98 presented by P. Chidambaram is known as the ‘Dream Budget’. 19. Jawaharlal Lal Nehru was the first Prime Minister to present the budget as he held the finance minister portfolio in 1958-59. 20. The maximum number of Budgets has been presented by Morarji Desai. He presented budget 10 times. 21. Morarji Desai presented two budgets on his Birthday on February 29. 22. R Venkataraman is the first finance minister of India who later also served as the President of India from 1987-92. Pranab Mukherjee is second. 24. Indira Gandhi has been the only woman Finance Minister in 1970-71. 25. Jaswant Singh had the shortest tenure as finance minister – only for 13 days! Stay tuned we would providing updates about Budget 2016 and its impact on your Personal Finance and budget.